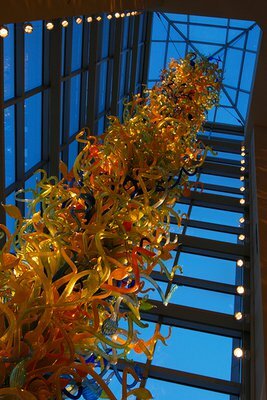 The Oklahoma City Museum of Art features the world's tallest Dale Chihuly tower. Standing 55-foot tall, this glass tower graces the entrance to the museum. From one of the nation’s finest university art museums to one of the world’s most comprehensive collections of American Indian art, visitors to Oklahoma’s art museums will find that they don’t need to travel far to experience a world-class museum. You’ll know you’ve arrived at the Oklahoma City Museum of Art when you spot the 55-foot tall, multi-colored glass tower hovering in the lobby. This beautiful, eye-catching piece is just a taste of the Dale Chihuly works that you’ll spot once inside. Take a spin around the ground floor to view the museum’s special and traveling exhibitions, or head to the second and third floors for the museum’s permanent collection, which includes works by Frank Stella, Georgia O’Keeffe, Rufino Tamayo, Pierre-Auguste Renoir, Marcel Duchamp and Rene Magritte. The Oklahoma City Museum of Art also offers the most comprehensive collection of Chihuly glass in the world. After you’ve viewed the exhibition rooms, you’ll continue through a hallway where the ceiling is filled with various Chihuly glass art pieces, which light up the hall with a variety of vibrant colors. Try to see how many cherubs you can spot in this unique feature. The museum also offers an on-site restaurant, theater and gift shop, where you can take home an authentic Dale Chihuly piece of art. The Gilcrease Museum contains one of the most comprehensive collections of American Indian and Western art in the world. Masterpieces by Western artists such as Frederic Remington and Charles Marion Russell hang on the walls of this Tulsa museum, and you’ll also find works by such non-Western painters such as Winslow Homer. In addition to breathtaking artwork, the Gilcrease is also home to Native American ledgers, historic manuscripts, maps and documents. After browsing carved sculptures by Willard Stone and a treasure trove of American Impressionist paintings, head outside to the Gilcrease gardens where 23 of the museum’s 460 acres have been developed. Each of the 11 areas within the gardens offer their own distinct feel with the Victorian Garden mimicking typical gardens of 1837 to 1901, while the Colonial Garden was created to resemble a garden from the 1700s. Another Tulsa institution recognized for its beautiful gardens and art collection is the Philbrook Museum of Art. Within its architecturally astonishing Italian villa, Philbrook’s permanent collections feature African art, American art, antiquities, Asian art, decorative arts, European art, modern and contemporary art, Native American art and works on paper. Outdoors, guests can take an audio tour of the Philbrook Gardens or stroll at their own pace. The south garden area has peaceful spots for meditating filled with plants and wrought iron archways, while the remaining areas feature native Oklahoma plants and stone pathways. At the Philbrook Museum of Art, both indoors and outdoors are a treat for the eye year round. The Fred Jones Jr. Museum of Art in Norman is recognized as one of the nation’s finest university art museums. Located on the grounds of the University of Oklahoma, the museum encompasses 40,000 square feet and features 16,000 permanent objects on display including the famous “Portrait of Alexander Reid” by Vincent van Gogh and several works by Renoir. One of the museum’s most important acquisitions is actually located outside. Called “The Sphinx,” the 1.5 ton, 10-foot tall bronze sculpture by Fernando Botero has been displayed in Venice, Florence, Tokyo and Singapore. Inside, visitors will find permanent collections of contemporary art, Asian art, art of the Americas, European art, photography and a variety of featured collections. Thanks to collaboration between the University of Oklahoma Athletics Department and the museum, admission is always free, so there’s no reason to miss this one-of-a-kind attraction. Visitors will find permanent collections from the Medieval, Renaissance and Baroque periods as well as a contemporary collection that showcases many artists from Oklahoma. Located at St. Gregory's University in Shawnee, the Mabee-Gerrer Museum of Art is the unexpected home of Oklahoma's only mummy. While many visitors are drawn to Tutu and the ancient Egyptian collection, the museum also boasts a wealth of 18th and 19th century European and American artwork, old world antiquities and arts of ancient America. Visitors will find permanent collections from the Medieval, Renaissance and Baroque periods as well as a contemporary collection that showcases many artists from Oklahoma. The museum's history is just as interesting as its one-of-a-kind artwork. The Mabee-Gerrer Museum of Art was named after Father Gregory Gerrer, a Benedictine monk who collected art on his travels to Europe, Africa and South America. Founded in 1919, the museum is also one of the oldest in Oklahoma. In addition to the expansive collection of sculptures, firearms and Western artifacts, the National Cowboy & Western Heritage Museum in Oklahoma City also features an impressive gallery dedicated to art of the American West. The 15,000 square foot gallery is packed with illustrations, graphic art, sculptures and paintings from some of the great Western masters of both past and present. Visit the museum to explore works by Albert Bierstadt, Tom Ryan, Charles M. Russell and Frederic Remington. Since 1973, the National Academy of Western Art's most coveted award has been the Prix de West. Each year since then, the winning artwork has been collected and presented by the National Cowboy & Western Heritage Museum, so visitors can browse some of the finest Western paintings and sculptures in the world. The collection currently spans five decades of Western masterpieces. Home to the largest collection of Judaica in the Southwest, the Sherwin Miller Museum of Jewish Art in Tulsa is dedicated to preserving and sharing the legacy of Jewish art, history and culture. Learn about the 5,000 year history of the Jewish people in the museum’s upper level, where you’ll spot displays of handwritten Torah scrolls, lovely menorahs and textiles of all sorts. The museum’s lower level features the Holocaust exhibition, which uses objects and artifacts brought to Oklahoma by Jewish refugees to tell of this dark spot in world history. In addition to the galleries, the Sherwin Miller Museum is also home to a library, numerous archives and a research center.